I'm so excited to finally post about this quilt I finished a few weeks ago for a precious little boy named Eli, who is due next month. 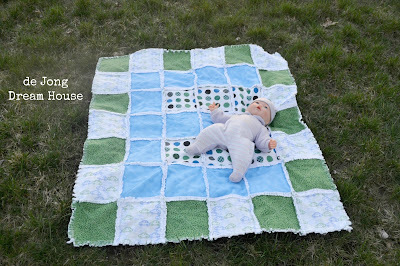 I missed the baby shower because my head was giving me grief, but it gave me a little more time to make this quilt, and a few coordinating goodies. 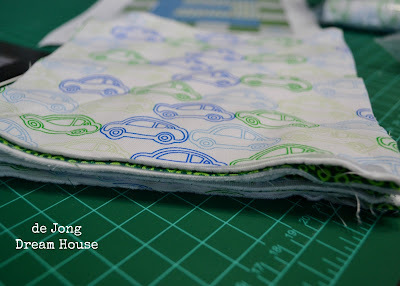 The idea for this quilt came when I saw the adorable car fabric at Joann. I knew I wanted to do something with it. 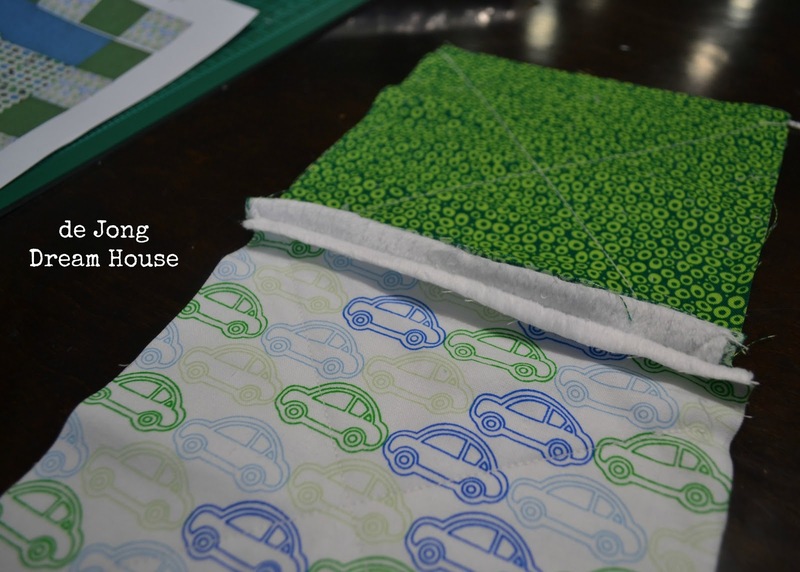 I really like how these fabrics work together. I'm realizing that I am terrible at guessing how much fabric I will need for a project. I bought a yard of each of these, but 2 yards of white minky and have plenty of each leftover. Enough that I could make another quilt! 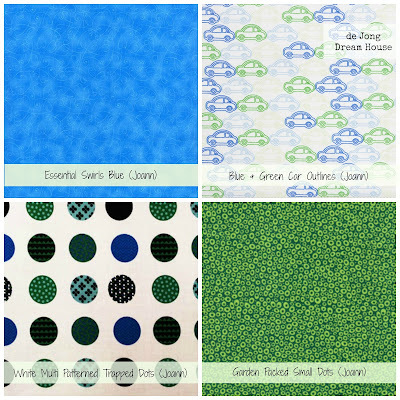 Before I knew Eli's name, I played around with a few different templates. 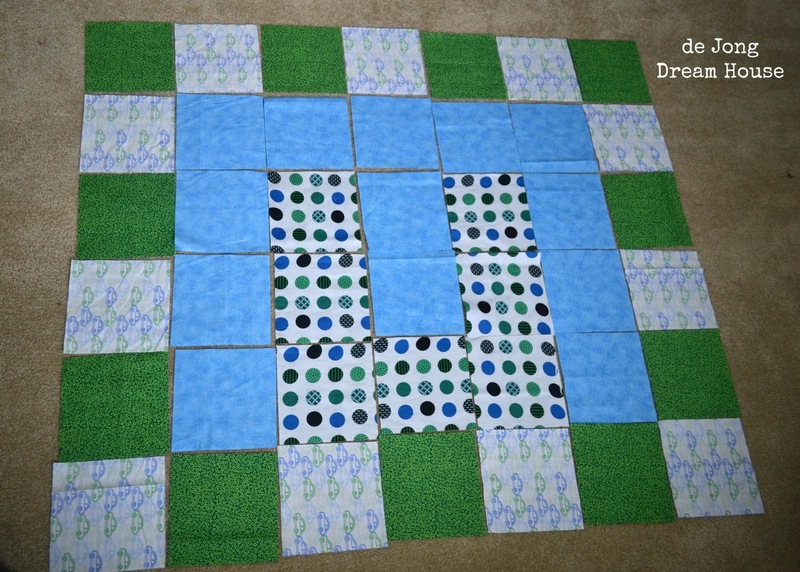 I had settled on the plus quilt on the bottom right until I realized I could make an "E" quilt. I'll save the pluses for another day. 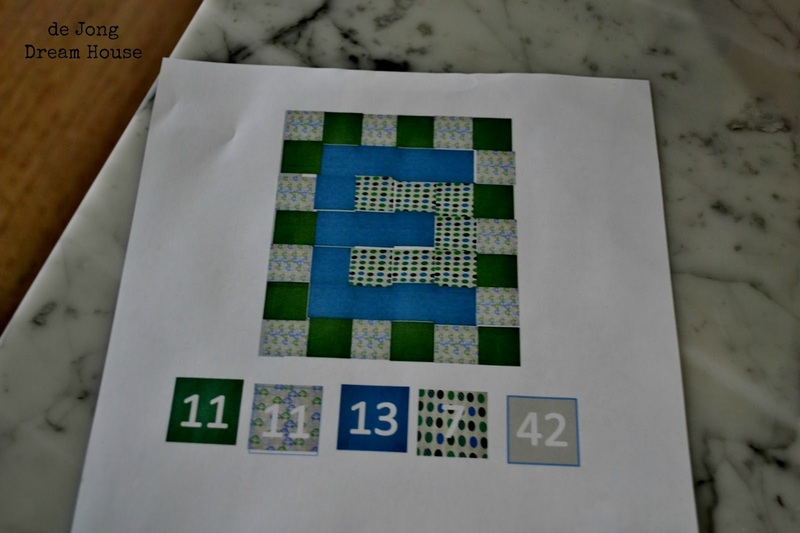 Once I settled on the "E" design, I counted out the squares I needed for each fabric. 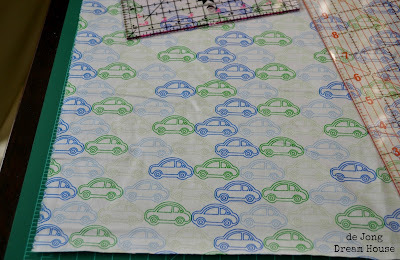 I still haven't learned how to cut out more than one square at a time, but the minky was a little tricky so I didn't want to experiment just yet. The main think to keep in mind when cutting the minky was to make sure that I cut all the squares in the right direction. 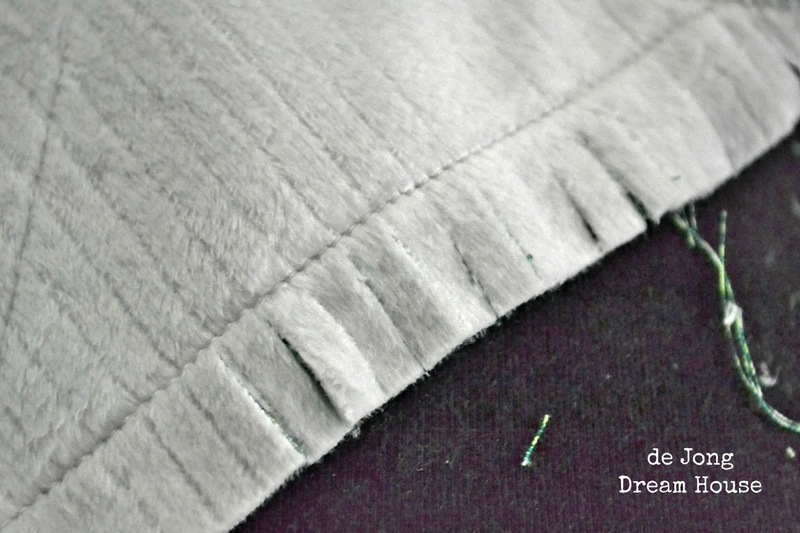 This was made easier by choosing a minky with straight lines. 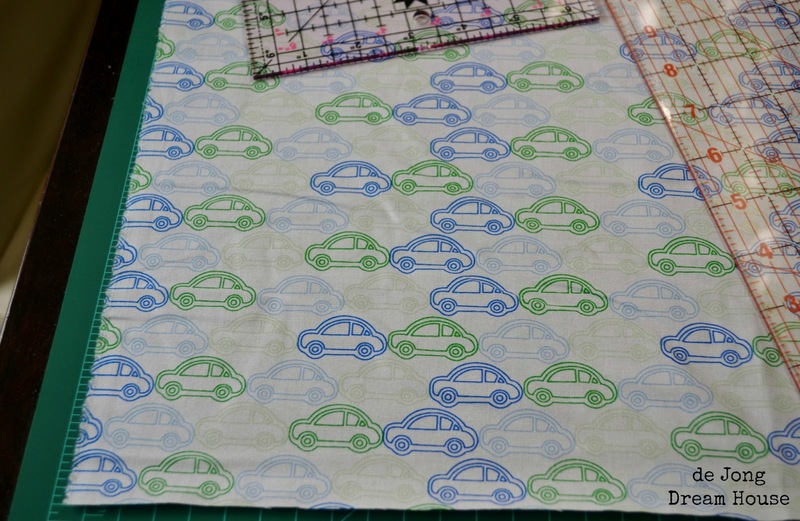 Is this not the cutest fabric? Cutting squares went really quickly this time. I was able to finish the entire quilt in one day! 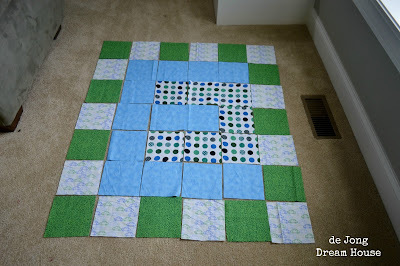 Once all the squares were cut, I laid them out in order to make sure I was happy with the design. I was. Something fun I discovered is that the quilt also makes an "M," which is Eli's middle initial. 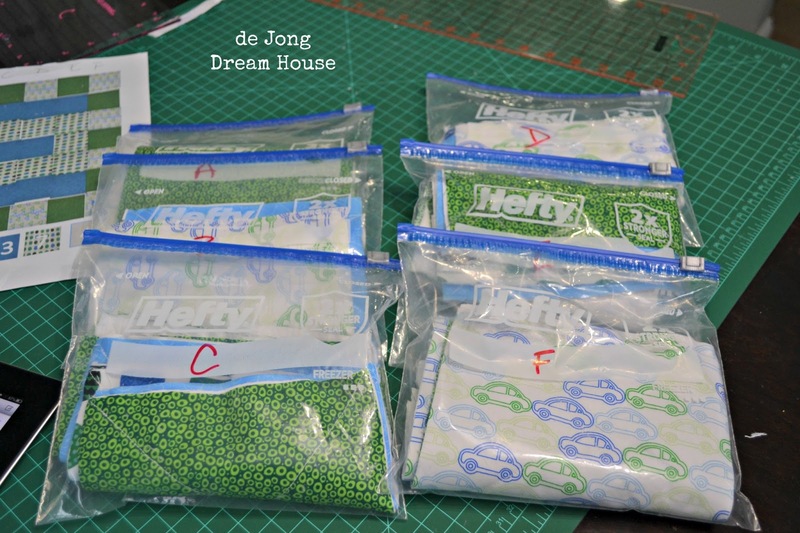 My baggie methods works well, so I used it again to hold the squares for each row. 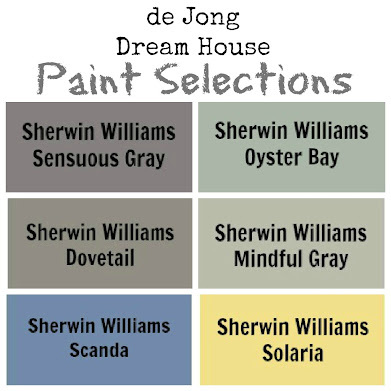 On my template, I assign a letter to each row. 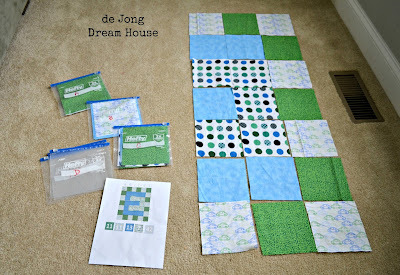 Then I put all the squares for that row in the corresponding baggie. 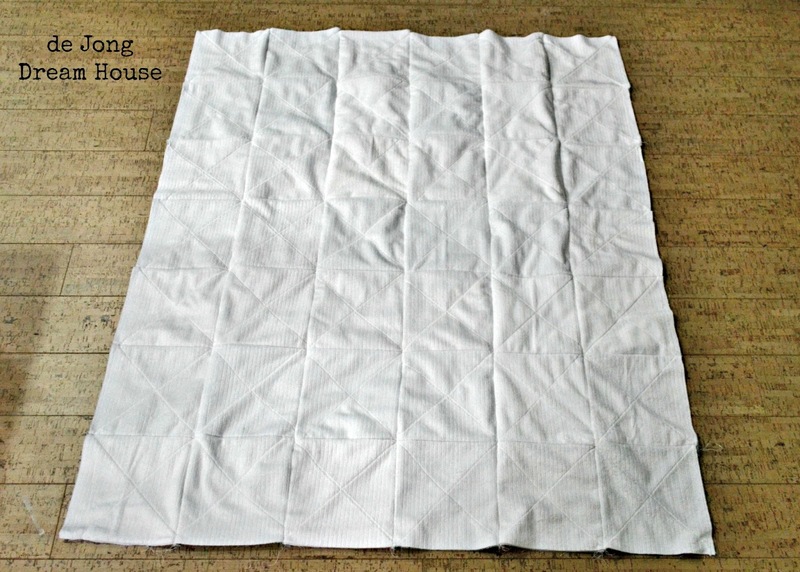 This keeps the squares in order, and makes clean up easier, especially when your sewing space is the dining table! This quilt was easier than my first one because the back is one solid color. 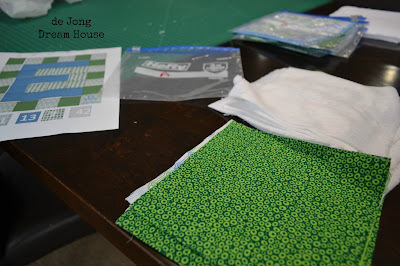 Instead of pinning fronts and back at this point, I simply put the top side squares in the bag, and then had a large stack of minky squares to match up as I started quilting. My set up for quilting. 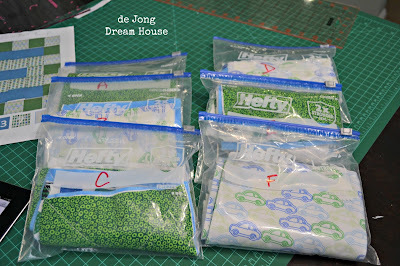 I emptied one baggie at a time, then had my row stack, minky stack, and template close at hand. 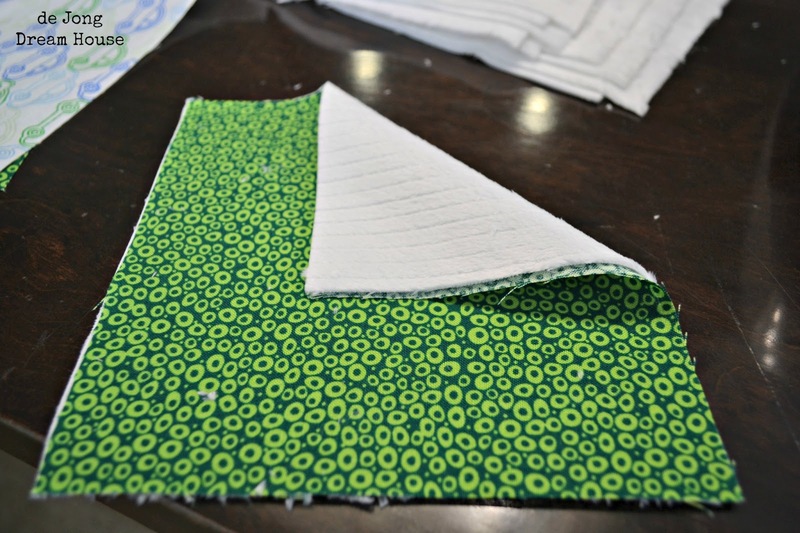 I lined up the fabric with the right sides out. The minky is so soft and plush that I didn't use any batting inbetween the two layers. 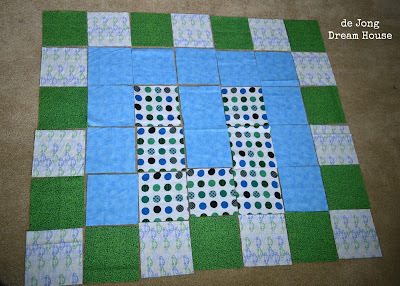 I also match up the minky so that the lines would be parallel the "E."
For quilting, I simply made an X across each square. 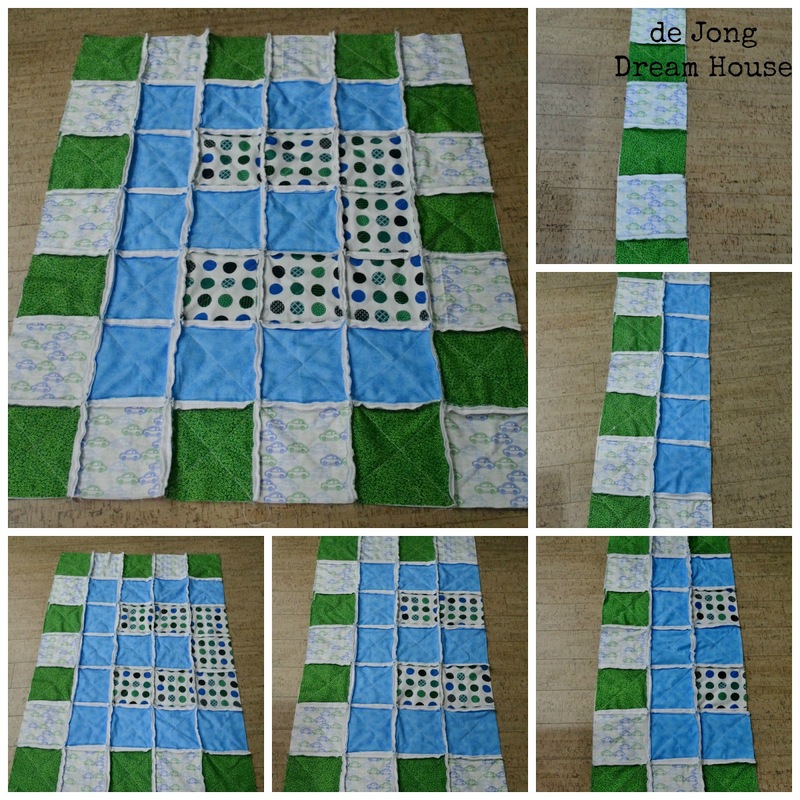 As I finished each square, I stacked them until I completed a row. I think some people go ahead and sew the rows together, but I like to do all the quilting first. 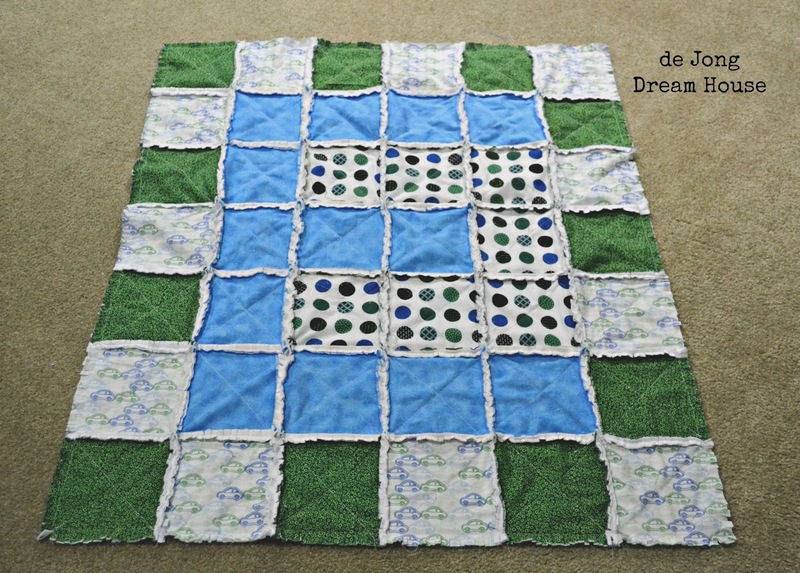 Once all the squares are quilted, I stitch together the rows. I refer to my template often to make sure that I put the square together in the right order. 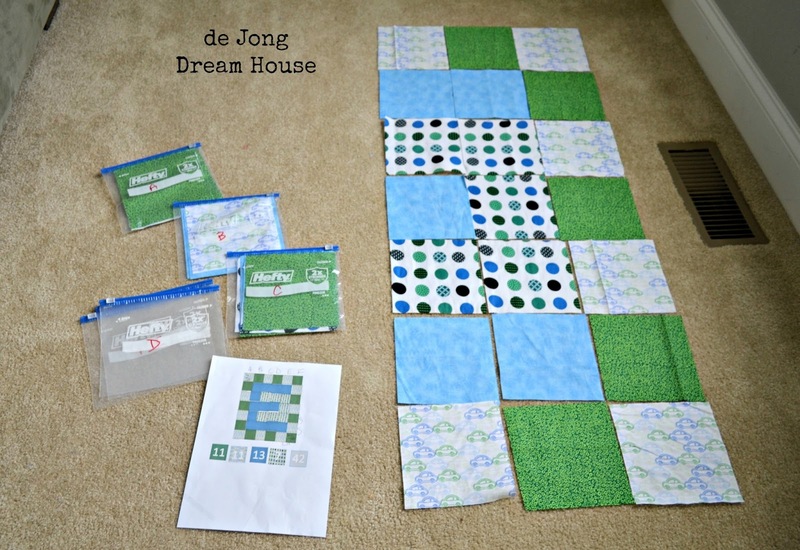 As I finished each row, I would put the completed squares back in their corresponding baggie. 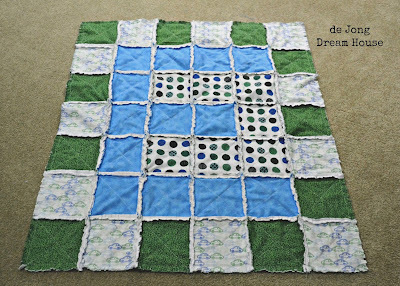 Since this is a rag quilt, I sewed the right sides together, so it looks like this. Next comes the rather tedious job of snipping the quilt. 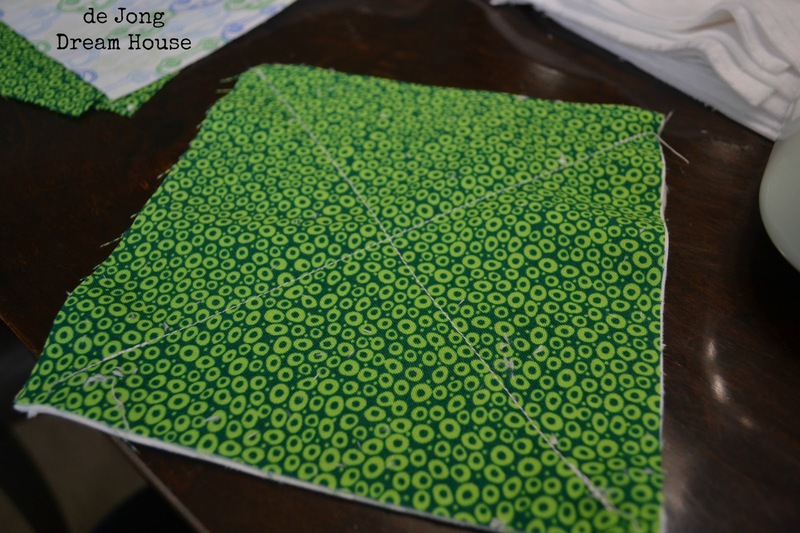 It's not so bad when you use rag quilt scissors, which are spring loaded. I was able to finish snipping after one episode of Glee. I used the lines of the minky to line up my snips. 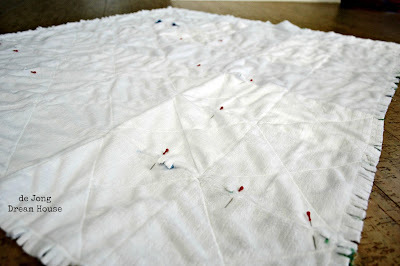 After snipping, I threw the quilt in the wash to start the fraying process. Washing also pulls the seams and out come the mistakes. I tug at each seam going up and down the quilt to find the loose seams. I mark them with a pin so I can go back and fix them. When re-stitching the loose seams, make sure that all the snips are out so they don't get sewn under. My son's doll, Pink Head, shows the scale of the quilt. This doll is the same size as our son when we brought him home. What happened to my baby?! Here's a sneak peak of my friend's shower gift. I have some more tutorials to do! You are a quilt-making machine! 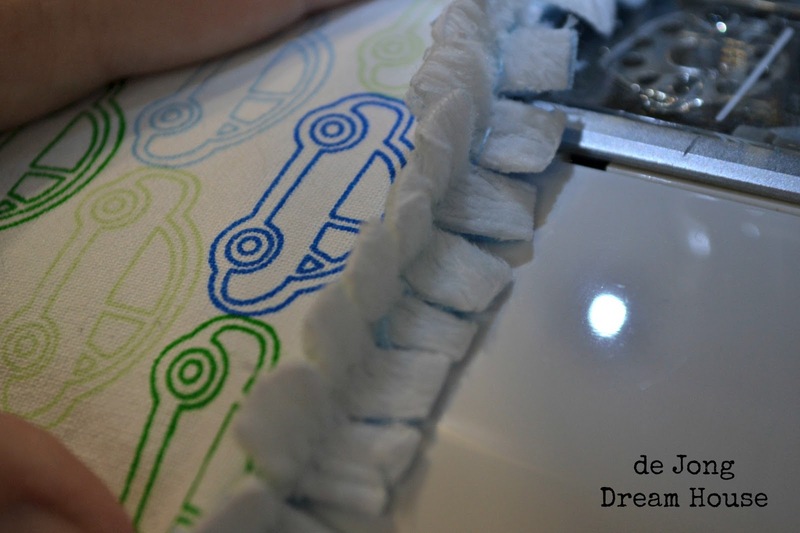 My that minky fabric just looks heavenly. I really love the fabric you chose, and hearing how the process just gets faster and faster is really encouraging to someone who is a bit terrified of quilting (but I really hope to venture into that realm one day). Another beautiful work of art, Jen. Eli is so blessed! Thanks for following! 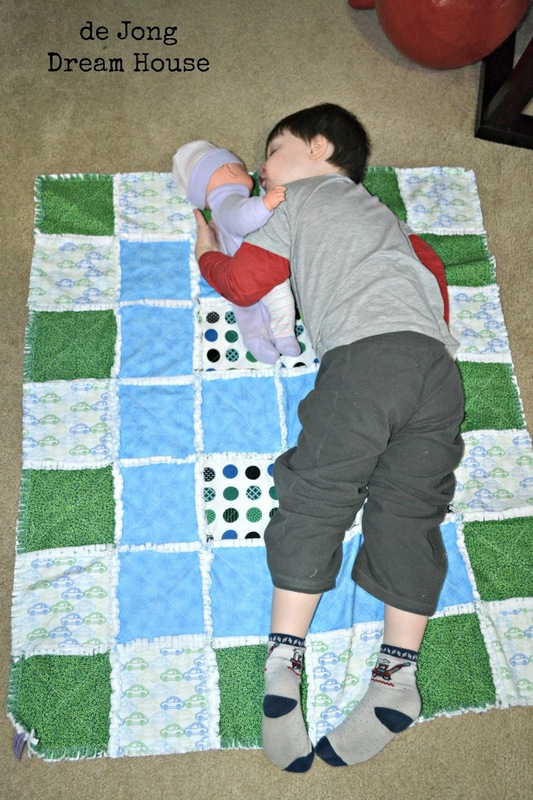 This is a very easy quilt! Good luck! Used to quilt until the biggies became too heavy for my arthritic hands and fingers to cope with. 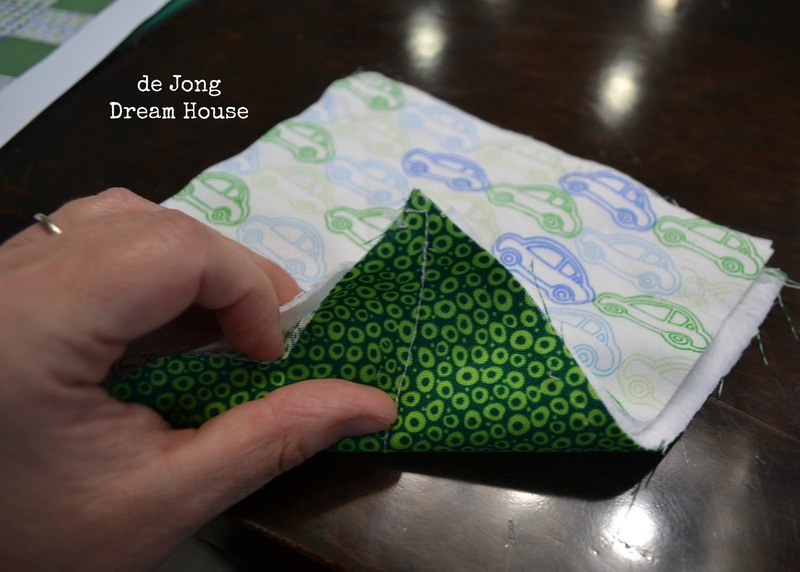 Toys, I find, use up the fabric as well, but are easier to handle - not to mention a lot quicker to complete! Glad I was able to bring back some happy memories. Your cuddlies are adorable! 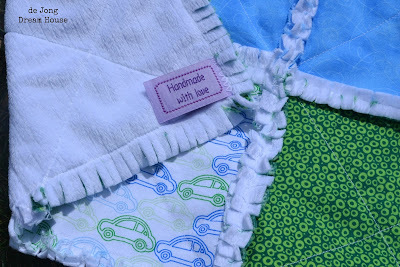 I love your rag quilt! I have done several of them but a little differently than what you have, I think I might try it your way next time. I am a new follower from the quilt along. How do you do it? I'm kind of making things up as I go along! 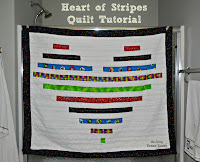 Looking forward to learning lots from the quilt along! Wow, you sure have taken to quilting! 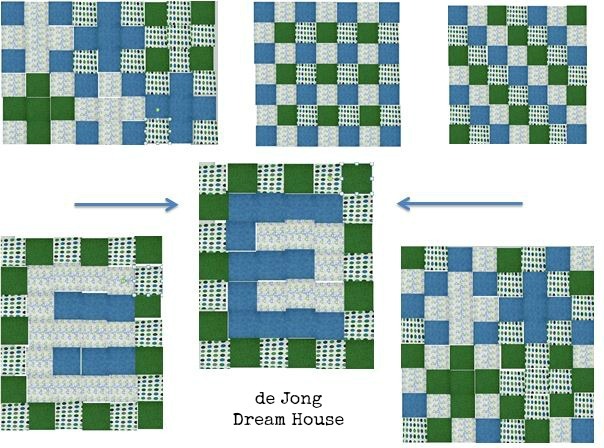 Amazing the quilts you have already completed. What a great baby gift! this...is...adorable. Oh my goodness, so cute! thank you! I loved this one so much. It was almost hard to give it away! It is SO soft! 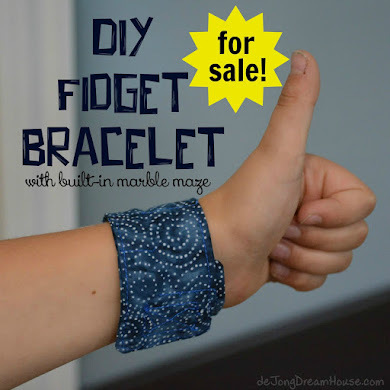 My son has already asked me to make something soft for him! Thank you! I started writing my tutorials so my brain-injured self could replicate them. 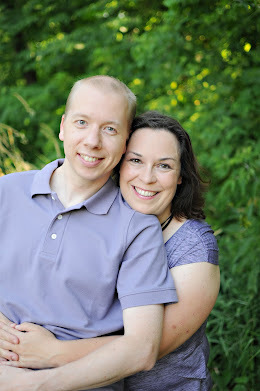 I'm happy to know that they are helpful to others, too! Turned out so cute! I love that it is an "E" and just stopping by from The CSI Project! lol...I bet you do! :-)I'm starting a new quilt with an M. It'll be my first time using triangles. I think I prefer monograms with letters with nice straight lines! 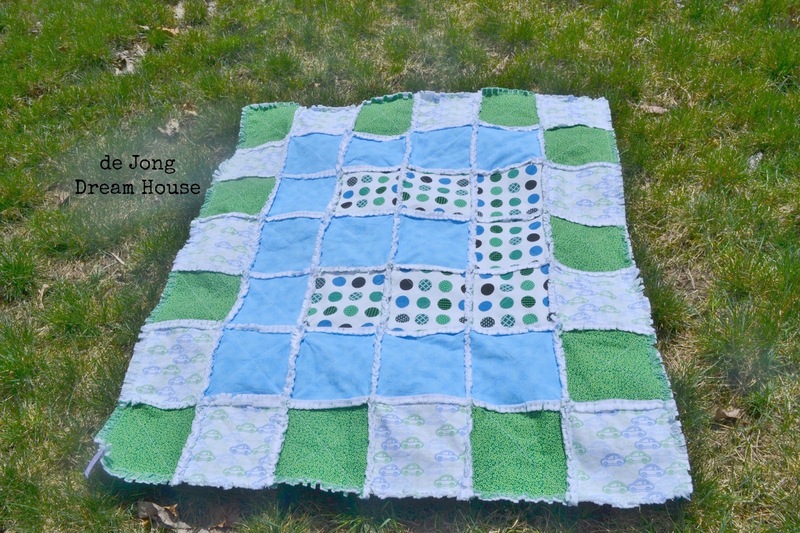 I love how you've created an E and also how the minky is on the front as well because it's a rag quilt... lovely and soft on both sides. 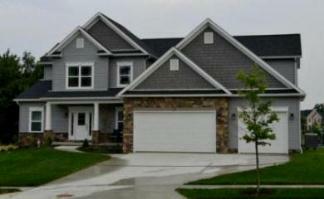 Oh I love this too! 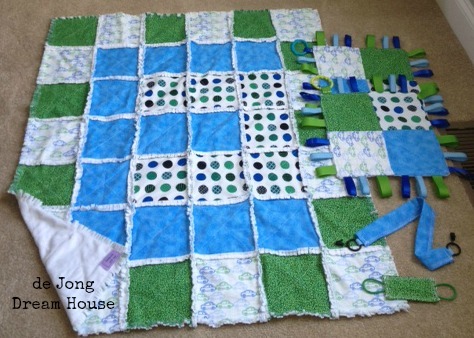 You are a very organized quilter. My three year old son has a doll also that the little girl next door gave to him. He loves his baby, only he calls her 'Dayday' because that's how he used to say 'baby' lol! 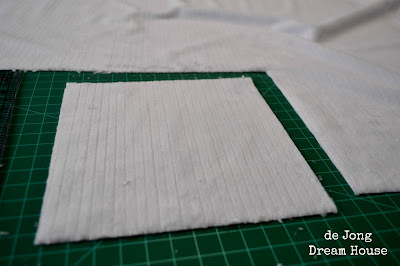 How did you connect the front to the back and what did you do to the outer perimeter? Did you leave the perimeter raggy as well? They do grow way too fast!! Thanks for the tutorial...I too love the initial and use of minky! 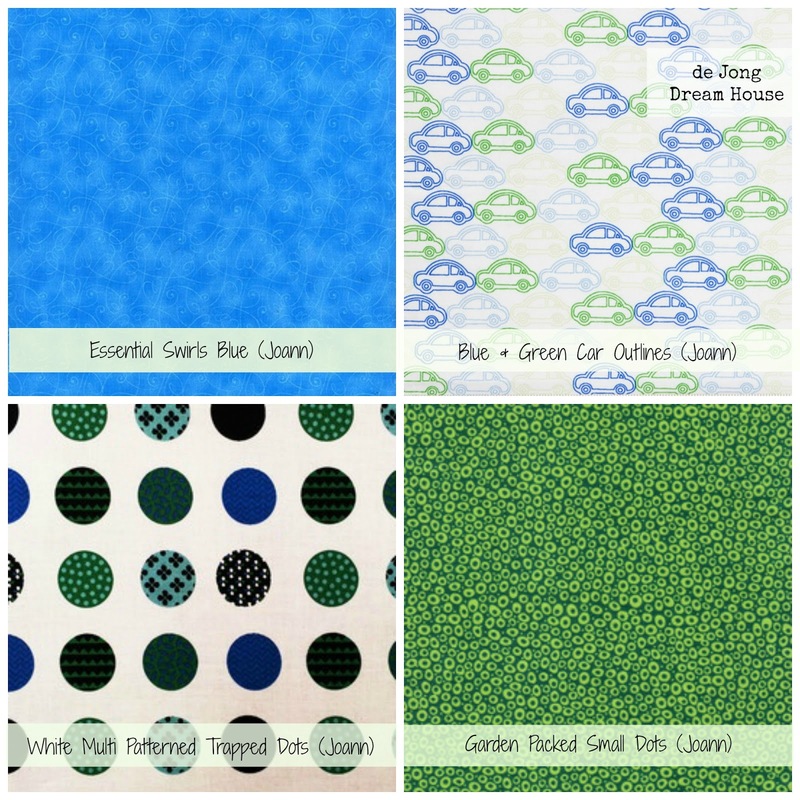 can you tell me what type of fabric is on the top, Minky, flannel, or cotton? The fabric on top is cotton. The fabric on the back is minky.